�Welcome to My Ghettoland� shows two pygmies, ancient original people of the forest regions of central Africa, holding up pillars at the base of the entrance to Ghettoland, �holding up civilization,� as the artist puts it. Above them, a woman in a red dress beckons, and a young girl dressed in white, wearing the head covering of the initiate, is carefully watched over by older women in the community as she begins her transformation into womanhood. This cycle of instruction, guidance and support has existed in the black community for generations. Lacy�s dominant themes of human spirituality, plus her eagerness to explore new mediums, propel her evolution as An artist. When the Rev. Zan Holmes asked her to design 51 stained-glass windows, �she just immediately lit up,� he says, and thus encouraged him to give her the freedom to create a comprehensive series of windows reflecting the history and struggle of black people through time. She has unfolded a people�s story in four sections: �The Creation,� �Journey out of Africa,� �The Migration� and �Civil Rights.� �She has captured what we were feeling in terms of the relationship between our Christian faith and our African and African-American heritage,� Holme�s says. Inspired by poet James Weldon Johnson, as well as by African and African-American folktales, Lacy users �The Creation� to display such familiar African motifs as the Bambara tyiwara figure associated with the creation and the harvest, Ananse the spider from Ghana, the great turtle of the Dogon, the rabbit, and the pepper bird. �Our story has to be told in our own terms,� she says about her use of these ancient symbolic creatures. Opposite, �The Creation,� on the other side of the sanctuary, is �Journey out of Africa,� below which is Lacy�s interpretation of the crucifixion. In a majestic boat, which appears to have wings emerging from the water, the Holy Family makes its journey out of Egypt. Rather than riding a donkey, they are in a boat, traversing the Nile. The identities of the figures themselves are changeable: The figures can also be perceived, according to Lacy, as Noah and his sons. In accompanying windows, Moses emerges from Sudan with a lamb. Priests are dressed in Ethiopian garb. �The birthplace of Christianity is in Egypt and Ethiopia,� Lacy asserts. �Let�s quit shuckin� and jivin�, and tell it the way it is. The crucifixion sequence relies upon an African-American interpretation of the crucifixion as the sacrifice of African-American youth, and the women of the community receive the news of Christ�s death in the cotton fields. �Pain in the cotton fields� is 'how Lacy refers to this window, saying that our ancestors received much bad news there. 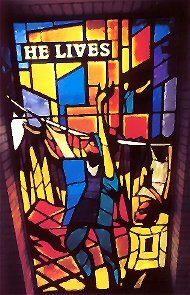 The church�s balcony windows are devoted to black America�s heroes and heroines. �The Migration� section begins with the figure of Harriet Tubman, surging forward, gesturing boldly across her window, as if to tell viewers to regard carefully what the artist has put out there for them to read. Other windows show black Union soldiers, the breaking of the chains of slavery and women making African-American strip quilts. The artist calls these women the �architects of our survival� and includes portraits of Sojourner Truth and Mary McLeod Bethune as well.